Hale County [is] focused on people having access to healthy foods, having access to a nice park to be physically active. We have had good success here. Located in Alabama’s rural Black Belt, Hale County is no longer the place captured so starkly by journalist James Agee and photographer Walker Evans in their 1941 book, Let Us Now Praise Famous Men. The book documented the abject lives of impoverished sharecropper families, mostly white, subsisting in the rural South. Hale County still struggles with poverty, but it is also home to innovative nonprofits and creative collaborations reimagining how to improve community health and well-being. Agriculture in Hale County benefits from local environmental conditions, including the water-retentive soil of the southern Black Belt region. That same soil once made cotton an important agricultural crop for the area; though, now, Hale is known for its catfish industry. These better-than-expected results are likely influenced by local conditions and initiatives that improve overall well-being. For example, field research suggests that a strong commitment to both providing access to health care and addressing social factors that affect health—such as housing and employment—plays a major role in community health. At the same time, a sense of connectedness among different generations and diverse sectors helps to promote overall health and meet community needs with limited resources. Hale County’s classification as a Bright Spot means that, on average, the county performed better than expected on a number of health outcome measures, given its characteristics and resources—that is, the socioeconomics, demographics, behaviors, health care facilities, and other factors that influence health outcomes. It does not mean that all residents here enjoy excellent health. Like other counties with limited resources, Bright Spot counties face challenges to attaining good health outcomes. Hale County’s performance, however, indicates that certain county conditions or programs may be helping generate better-than-expected outcomes—and that other resource-challenged Appalachian counties may benefit from adopting similar initiatives. Hale County represents a metropolitan county in Southern Appalachia. It was the only county in Appalachian Alabama identified as a Bright Spot. Hale County lies in Appalachia’s southernmost part, where the mountains may be more accurately described as foothills. It is approximately 33 miles southwest of Tuscaloosa. Three distinct areas make up most of the county: the town of Newbern in the south, the city of Moundville in the north, and the county seat of Greensboro in the middle. The remainder of the county consists of small rural communities, although the county is designated by the federal Office of Management and Budget as a metropolitan county. With a population of just over 15,000, Hale County is Alabama’s tenth-poorest county. Unemployment in 2014 was 9.9 percent, compared with 6.5 percent regionally and 6.2 percent nationally. Classified by the Appalachian Regional Commission as economically distressed in fiscal year 2017, Hale County has a median household income of $33,315, about 60 percent of the national median. The catfish industry employs many county residents, and more than half of the county’s residents work in health and social assistance, retail and wholesale trade, or manufacturing. The transportation and real estate sectors offer the highest-income jobs. Hale’s population is 58 percent black and 41 percent white, with other races, including American Indians, nominally represented. Nearly half (48.8 percent) of adults have some college education, compared with 63.3 percent nationally. Approximately 16 percent of the population receives benefits from the Social Security Administration, compared with about 5 percent of the national population. Beyond the poverty are signs of community investment and creative use of limited resources. The field work conducted for this report shows that a handful of leaders and nonprofits have played a major role in addressing the county’s housing shortage. Hale County has emphasized collaboration to leverage available resources. Stakeholders note that county residents have looked through the lens of opportunity instead of the lens of need. As in the other Bright Spot communities explored in this report, people in Hale County have worked to elevate physical, social, and economic health in several ways. In Hale County, these efforts include developing affordable housing initiatives, establishing social programs for helping elderly people as well as those who are isolated and who have mental illness, and creating a health care clinic network. Presence of strong social programs and sustainable community-focused nonprofits: The long history of social support and community development of nonprofits in Hale County indicates strong community support and a high likelihood that the work of these nonprofits aligns with the needs of the community. 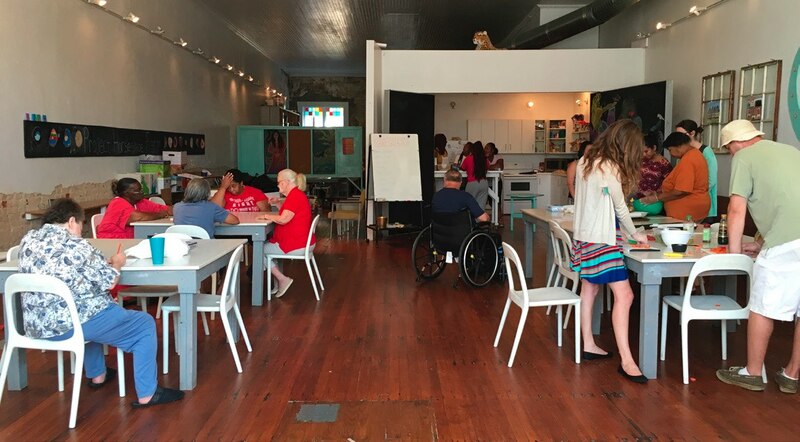 Cross-sector collaboration of local leaders, organizations, and volunteers: Organizations in and outside of health care regularly communicate and collaborate face to face to address community issues such as transportation, housing, and chronic health conditions. The presence of committed and resourceful leadership supports these efforts. Volunteers often fill in when funding is insufficient. Access to health and human services: Hale County has the basic infrastructure necessary to maintain and strengthen access to health care services. The county has a hospital, network clinics, home health services, rehabilitation and therapy, and mental health services. Targeted support of youth and at-risk groups: Empowering youth and providing opportunities for them to engage with the community creates strong social connections between generations. It also provides the opportunity and space for young people to become community leaders. The elderly, as well as other vulnerable groups, benefit from strong social support systems. Community connectedness, the presence of exceptionally strong nonprofit leaders, and a focus on addressing underlying social factors such as lack of housing, workforce training, and substance abuse, seem to be important components in making health a shared value in Hale County. County residents also see value in collaborating with organizations outside the county, such as the Auburn University School of Architecture, to create a win-win for the university’s own learning initiatives and for Hale County residents. Hale County has undertaken efforts that fall into four overarching categories echoed in other Bright Spot counties: leadership, cross-sector collaboration, resource sharing, and local providers committed to public health. Strong, sustained leadership is evident in all of the Bright Spot communities, but especially so in Hale. Leaders include longtime resident entrepreneurs, members of the faith community, and dedicated health providers. Three programs have played a major role in shaping the county’s emphasis on housing—a known social factor that impacts health and well-being—and using local resources creatively to meet needs. These are the Hale Empowerment and Revitalization Organization (HERO), the Auburn Rural Studio, and Project Horseshoe Farm. Pam Dorr has been a dedicated steward of Hale County for years. She came to Hale County from San Francisco as a fellow in the Auburn Rural Studio program, one of Hale County’s first collaborative initiatives aimed at solving the county’s affordable housing problem. She found the work so meaningful that she decided to stay in Hale County and, in 2006, revived a defunct 501(c)(3) organization known as HERO. Under Dorr’s leadership, HERO worked to provide affordable housing and utilities assistance to residents. It focuses on three areas: supporting affordable housing development and education to reduce homelessness; helping families cover utility bills; and creating social enterprises that help residents in other ways, providing them with the knowledge, skills, and confidence to foster their own well-being. HERO does this through a combination of grants, partnerships, and reliance on a culture of recycling and resourcefulness. During her tenure at HERO, Dorr recognized the need to shift from a business model that relied on federal grants for 94 percent of its funding to a more entrepreneurial model designed to generate income from local businesses. Dorr helped create 11 small businesses and at least 50 new jobs. Those operations have generated more than $15 million in profits that were invested back into the community to build affordable housing for a large number of residents. HERO also subsidizes utility bills for approximately 1,800 households, which represent 30 percent of all homes in the county. These subsidies are a big part of the shelter safety net in Hale County. Dorr’s vision was not limited to housing. She wrote many grant proposals that have influenced public health, including one credited with helping improve the county’s high infant mortality rate in the early 2000s. In Hale County, there is a rich network of health and human services organizations collaborating with organizations rooted in very different fields, ranging from the Auburn University School of Architecture to local businesses and public housing. For example, the publicly owned Hale County Hospital, which provides a full range of primary care services, works closely with the Hale County Cooperative Extension Office, keeping it informed of new services as well as offering blood pressure checks and other supportive services at events and festivals. Established in 1993, Auburn Rural Studio is a unique, Hale County–based nonprofit internship program created by the Auburn University School of Architecture. Students accepted into this program receive poverty-level income and live in substandard living conditions while learning to work with tight resources to design and build sustainable infrastructure for Hale County and its residents. Third- and fifth-year architecture students spend months— even years—living in a restored farmhouse in Hale County as they see their projects through to completion. The students and local helpers learn how to be resourceful and creative as they organize, design, and construct a project. The projects emphasize addressing community infrastructure deficits, low-cost construction and operations, sustainability, local sourcing of building elements, and student leadership development. 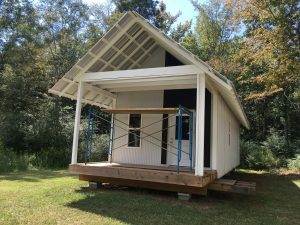 One of Auburn Rural Studio’s more recent endeavors is the development of “$20K Houses.” Students and staff are putting together a portfolio of relatively easy-to-build one-bedroom homes designed to be affordable and energy-efficient. Other community-centric projects have included new builds and renovations for the Antioch Baptist Church, the Newbern Volunteer Fire Department, the Hale County Animal Shelter, the Akron Boys and Girls Club, the Safe House Black History Museum, and, most recently, the redevelopment of Lions Park. Over the years, Auburn Rural Studio has engaged students in more than 170 projects in Hale and two other counties, often attracting resources from national nonprofits. By recognizing that lack of safe, affordable housing can negatively impact health, Auburn Rural Studio is making health a shared value. A number of other collaborative programs in Hale County support at-risk populations such as youth and the elderly. Several of the county’s most successful programs give young people meaningful ways to contribute to their personal development, to their families, and to their community. For example, YouthBuild, a national program with an active chapter in Hale through HERO, teaches construction skills to young people who have dropped out of high school as they work toward obtaining their GED. YouthBuild collaborates with Auburn Rural Studio on a wide range of construction projects, providing opportunities for creative, meaningful work. Hale County has an industrial board that serves as a de facto chamber of commerce. While the board fosters cross-sector collaboration, a major focus is on helping secure resources, spur economic development, and attract business. The board is composed of representatives of local organizations and businesses, which have an interest in and sense of responsibility for helping improve the health of the county. Many entities across the county share resources. Project Horseshoe Farm (PHF) has grown adept at doing this to meet the needs of the community’s most vulnerable populations: children, seniors, and adults with mental illness. Launched in 2007 by psychiatrist John Dorsey, PHF recruits college graduates in their “gap year” between graduation and medical school to live and work in Hale County, operating community-based health and service programs. PHF’s student recruits live on the farm in a bunkhouse built by Auburn Rural Studio students and work with the farm’s senior community center program, mental health housing, and youth after-school program. Students lead day programs four days a week at the Community Clubhouse, a senior center that sits in the center of town. The programs are for the elderly, those who are isolated, and those with mental illness, and are designed to overcome the isolation and lack of purpose that often accompany old age and mental illness. Each day has a theme, such as arts and crafts or nutrition and cooking. A volunteer nurse practitioner comes in to take blood pressure, provide nutrition counseling, and make sure participants are taking their medications. Moreover, the program provides snacks for the attendees and delivers meals to seniors who cannot get to the clubhouse. PHF also operates an independent living program for women, most of them elderly, who are transitioning from being institutionalized for mental illness. Dorsey bought and renovated a farmhouse capable of housing up to 12 women. The farmhouse is not an assisted living facility—residents must cook and take care of themselves—but PHF students and other volunteers are accessible to the residents 24 hours a day, 7 days a week. Before creating the senior center and the farmhouse, PHF started with an after-school program for fourth- and fifth-graders. Dorsey partnered with local schools and teachers to provide tutoring, mentoring, and enrichment programs for the children. The success of this program is quantifiable: 70 percent of the children in the program improved at least one quartile on the math portion of the Alabama Reading and Math Test. Also, more than 20 percent of the children advanced one to two years in their Gates-MacGinitie reading levels. The program supports more than 80 children every day, and has a high retention rate, with children returning year after year. In an area where health decisions are often made by “the pocketbook,” many Hale County residents think about health in terms of whether they can or should seek treatment. Local health facilities and programs such as Auburn Rural Studio, HERO, and PHF approach health from a different angle, working to address conditions such as housing, education, or work opportunities that can help improve overall community health. Creativity, collaboration, and strong leadership are making a difference in Hale County. Across sectors, partners are operating innovative, entrepreneurial programs that make efficient use of local resources and recruit people from both inside and outside of the county to create an environment that fosters health. A resourceful, entrepreneurial approach by nonprofit and faith-based leaders has helped to advance community well-being, in part by tapping into the strong culture of volunteerism here. Relationships between generations and different sectors are part of what brings the community together. Several programs work to reduce social isolation and address mental health for vulnerable populations, such as the elderly, and to support and nurture young people. Access to fundamental health care services is good, but community leaders also recognize the importance of social factors beyond medical care, including affordable housing and good jobs, to support health and well-being. This broad approach to health as part of the fabric of everyday life, combined with a commitment to ensuring that all residents have the basics they need for good health, has helped Hale County accomplish much with few resources. Agee, James, and Walker Evans. 1941. Let Us Now Praise Famous Men. Boston: Houghton Mifflin. Bernstein, Fred A. 2005. “In Alabama, a Poor County is Rich in Modern Architecture.” New York Times, December 25, 2005. Accessed May 15, 2018. Catlin, Bridget, A. Jovaag, and J. Williams Van Dijk. 2015. 2015 County Health Rankings Key Findings Report. Population Health Institute, University of Wisconson, Madison, Wis.: County Health Rankings & Roadmaps. Data USA. 2017. Hale County, AL. Downes, Lawrence. 2011. “Of Poor Farmers and ‘Famous Men’.” New York Times, November 26, 2011. Accessed May 15, 2018. Edge, John T. 2010. “Pie + Design = Change.” New York Times, October 8, 2010. Accessed May 15, 2018. Grabowski, David C. 2007. “Medicare and Medicaid: Conflicting Incentives for Long-Term Care.” The Milbank Quarterly 84 (4): 579-610. doi:10.1111/j.1468-0009.2007.00502.x. Marshall, Julie L., Logan Thomas, Nancy M. Lane, G. Mark Holmes, Thomas A. Arcury, Randy Randolph, Pam Silberman, et al. 2017. Health Disparities in Appalachia. Appalachian Regional Commission. Rural SW Alabama. 2017. About Rural Southwest Alabama. Sawyerville Day Camp. 2017.Sawyerville Day Camp. See Table 6 in the data appendix at the end of this case study for a full list of actual health outcomes for Hale County compared with predicted outcomes. For details on the outcome measures, see the data files accompanying the report Identifying Bright Spots in Appalachian Health: Statistical Analysis. Table 4 in the Hale County data appendix at the end of this case study provides a quantitative profile of county characteristics. This includes receipt of benefits either through the Old-Age, Survivors, and Disability Insurance (OASDI) program or the Supplemental Security Income (SSI) program in 2014. For a full explanation of the methodology, see Appendix B: Research Approach. For a list of key informants interviewed for this county, see Table 5 in the data appendix at the end of this case study.